Heat oil in a pan, add cumin seed, onion, tomato & saute few mins. Add g.chilles, all powders , methi leaves followed by soaked rice & saute few mins. Add 4 cups of water & check the seasoning. Cook until almost done & serve with raithas. Yum, I wish I had some fresh fenugreek! Yummy pulao. i like this version of methi pulao. will try this. Never tried this one...looks so gud...shall try..
Looks very good. 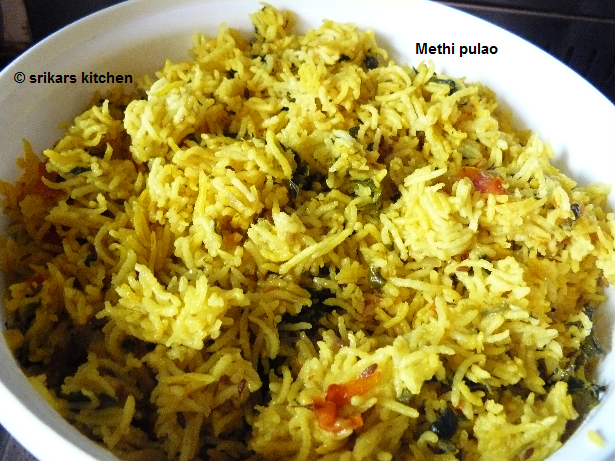 Some how Methi adds magic to an kind of pulav, I tend to throw in a handful into almost all pulavs! nice color and yummy pulav..
Has a great health benifit!! love the simple flavourful dish great with raita!! Lovely dish, looks healthy and yummy. Methi pulav looks so tasty! Thats a flavorful one! Never tasted before,looks nice!